Happy Fourth of July! 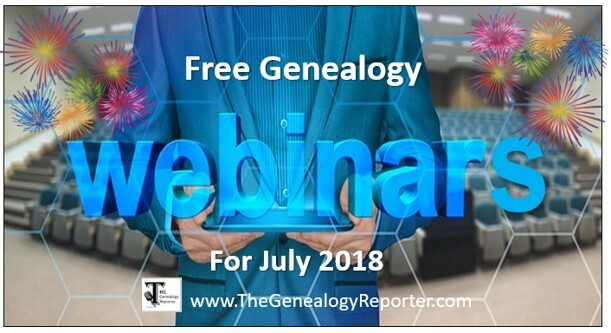 Celebrate with these free genealogy webinars for the month of July. Not sure what a webinar even is? Click here to learn the details, then return back to this page to see all the goodies available for the month of July! 6 July, Friday, “Legacy 9 Unlocked (part 4): Adding Estate/Probate Records,” by Geoff Rasmussen. 11 July, Wednesday, “The Art of Negative-Space Research: Women,” by Jeanne Bloom. 13 July, Friday, “Freedmen’s Bureau Records – Valuable to ALL Southern Researchers,” by Diane L. Richard. Illinois Genealogical Society offers “Museums Have Records, Too! 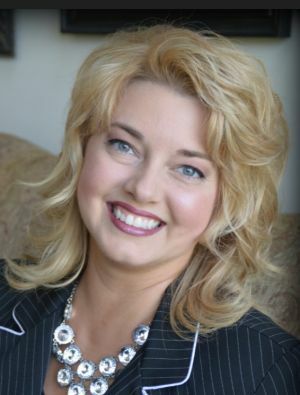 Locating Your Ancestors Behind Closed Doors,” by Melissa Barker, 10 July 2018, 8 PM CST. Genealogists are always looking for places where records are located. More and more these records are being found in places that are not your typical archives, library, or genealogical society. One of these places is a museum. Many museums have back rooms filled with genealogical and historical records just waiting for the genealogist to discover them! Wisconsin Genealogical Society offers “The Marriage of the Waters: The Erie Canal and the Opening of the Midwest,” by Annette Burke Lyttle, 17 July 2018, 7 PM CST. The Erie Canal–a project many labeled hopeless and impossible–opened the Midwest to settlement and prosperity. It provided a far easier migration route to the Midwest than any of the land routes available, and it also gave settlers on the Midwestern frontier a less expensive way to get their goods and produce to Eastern markets. Learn about the building of this engineering marvel and how it affected the lives of our ancestors. Southern California Genealogical Society offers “Beginner’s Guide to Photographing Family Treasures,” by Devon Noel Lee, 19 July 2018, 6 PM PST. Your home is filled with personal and family treasures in the attic, garage, shelves, and walls. Preserve the priceless treasures in photographs. You do not need to be an expert photographer to spotlight your keepsakes and their stories. Come and learn simple tips to take magazine quality photos. 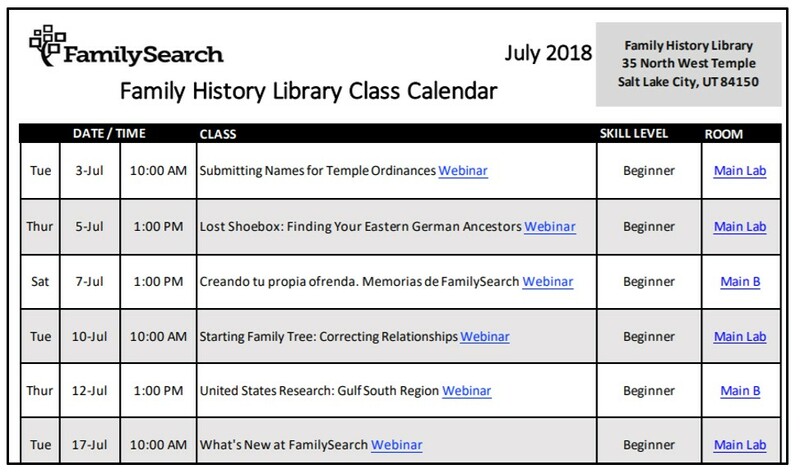 Florida State Genealogical Society offers “Organizing Your GENETIC Genealogy,” by Diahan Southard, 19 July 2018, 8 PM EST. Most individuals have hundreds of genetic cousins. Come learn a few methods you can start using today to help you organize your genetic genealogy research. Georgia Genealogical Society offers “Freedmen’s Bureau Records – More Valuable to Anyone’s Southern Research Than You Might Have Thought,” by Diane L. Richard, 25 July 2018, 8 PM EST. Many overlook records that they think pertain to only one group of people. Though an invaluable and rich resource for information on freed slaves, these records also cover many other southerners from DE to TX – including ex‐soldiers, impoverished widows, and destitute parents. If your ancestors lived in the south in the immediate post-civil war time period, regardless of race and pre-war circumstances, you will want to learn about these records. 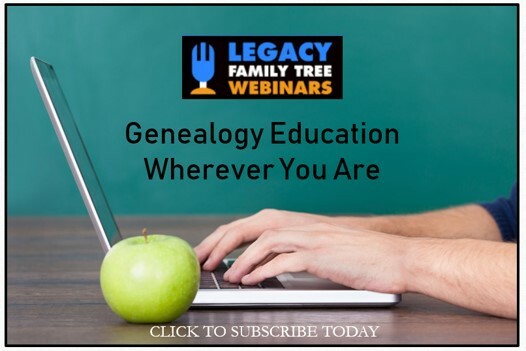 The Genealogy Reporter has an affiliate relationship with Legacy Family Tree Webinars. Clicking on a link in this article may result in a commission being paid to The Genealogy Reporter at no additional cost to you.